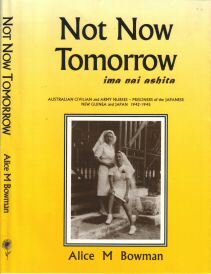 Not Now Tomorrow by Alice M Bowman is the story of the Rabaul Nurses; a small group of Australian civilian and army nurses captured in New Guinea at the beginning of the Pacific theatre (1942 - 1945) of the Second World War (WW2), which began in Europe in 1939. The book traces the nurses' story, from the approach of war in Rabaul, New Guinea, until its dramatic end in Japan. Under the house name of Daisy Press, Not Now Tomorrow was published in 1997 by Bowie's step-daughter, Claire Déglon Marriott. Not Now Tomorrow was bound and printed in Sydney, Australia, by DLT Printing and although the imprint page states 1996 when the manuscript was sent to the printers, the book was not actually launched until 1997. The format is a perfect bound book, with a hard-card cover and dust jacket; there are 264 pages printed on quality paper, with bibliography and notes. The pages are supported with photographs and maps, forms and newspaper headlines and enhanced with twenty-one illustrations by Claire's husband Graham Marriott (some appearing in this web site). 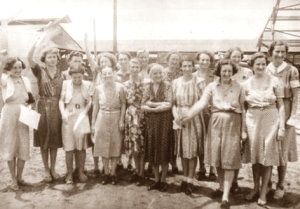 The production of Alice M Bowman's book, Not Now Tomorrow, was one of those rare events in the re-telling of World War II history and provides an opportunity for all Australians to learn about the story of the Rabaul Nurses and the larger canvas of the fall of Rabaul to the Japanese and the tragic consequences, which to this day remain unresolved. For purchase of the book or any questions you may have, please make contact via this link. Prices quoted are applicable within Australia only. Every effort is made to ensure accuracy of price and availability of book at time of printing, but it may be necessary to increase price and/or postage under certain circumstances.